patch andi: I won!!! I won!!! You may have noticed all the giveaways happening in honour of the launch of Sewn (a new adventure for the lovely Sarah Fielke). Well, I won a giveaway from the lovely Sarah herself. 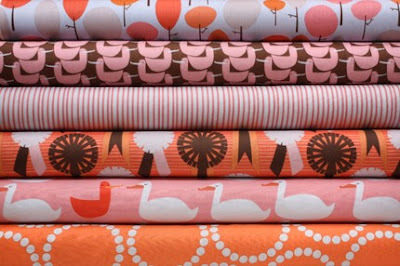 They are the 'Feathers' selection from the new Red Letter Day fabric collection by Lizzy House. Hope you are having a happy Monday too. I just saw your name over there! Congratulations!! Well now you're just showing off! Sorry - is the jealously showing? Good for you!!! You lucky thing...so bloody jealous!!! Lucky you! Congratulations! Love those fabrics! The Red Letter Day fabrics are too cute! Lucky you! I made one of here quilts and she left me a great comment. Lovely woman. Yay! Consider it a quilty wedding present Andi :) Love that hot pink veil. Make sure and show us pics!! Just saw your comment on my blog but I couldn't reply...would love to hook up when I am in Melbourne! you lucky duck you!! can't wait to see what you make with them!! oh, hurray for you!!!!!!! if i were you i'd be squealing in delight for the rest of the week! i was just looking at this fabric tonight...i want to get some...is it as pretty in person as it looks on the computer?